This labyrinth, planned, designed and built by Matthew Nicola Rispoli as his Eagle Scout Leadership Project was dedicated on September 30, 2007. 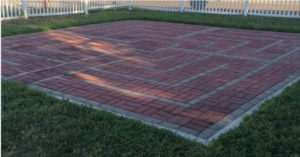 It is located in St. Andrew’s Park adjacent to the church’s parking lot and is available to anyone in the area who would benefit from this type of meditation tool. The information below explains the history behind a labyrinth, and also how they are to be utilized. Dating back to Greek mythology, the labyrinth, in varying patterns, is found in many cultures. The labyrinth was a central feature in many of the European Roman Catholic churches in the middle ages, and many still exist today. The most famous is at Chartres Cathedral near Paris, France. The labyrinth is regaining popularity today as a spiritual tool used for meditation and to quiet the mind. A labyrinth is not a maze. It has no wrong turns, no dead ends, no blind alleys. Its single path winds its circuitous way to the center, and out again. Walking the labyrinth is symbolic of the journey to the center of yourself, and back out into the world; a spiritual metaphor for life’s journey. This labyrinth was planned and designed by Matthew Nicola Rispoli, and constructed as his Eagle Scout Leadership Project in August of 2007. Matthew is an Eagle Scout with Boy Scouts of America Troop 6 of Brownsville, Texas. Assisting Matthew in his project were Tony Llongueras, Gabriel Ochoa, Sarita Burns, Allen Garcia, Shirley Green, Colten McKinney, Samantha Lester, and Nick Wilde.